WNS South Africa Managing Director, Johann Kunz, with award winning employees at the BPESA National Industry Awards. 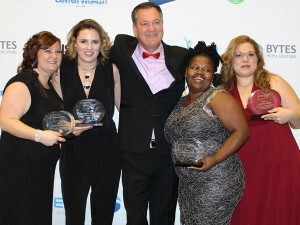 WNS Global Services South Africa, a leading global business process outsourcing (BPO) company, was recognised as the Best Large International Outsourced Contact Centre provider in South Africa for the second year running at the BPESA National Industry Awards, held at the Cape Town International Convention Centre. WNS South Africa also received the Community Spirit Award, which recognises the company's significant contributions made through various community upliftment projects undertaken by the WNS Cares Foundation, the company's corporate social responsibility arm. In addition, three WNS South Africa employees were also recognised for their outstanding achievements made in fulfilling their respective roles. These awards included the Best Contact Centre Operational Manager, Best Contact Centre Supervisor and Best Client Services Manager for Outsourced Services. With WNS South Africa receiving recognition as the frontrunners in five separate awards categories on both a company and an individual level, the company has been nominated as finalists in the ContactCentreWorld Top Ranking Performers Awards to take place early in 2017 in Las Vegas, USA. "We are exceptionally proud of this achievement and look forward to showcasing South Africa's telling BPO story on a global stage as it is most worthy of praise. Receiving such industry recognition as a company validates our solution approach and helps us to provide our clients with the most impactful business partnership. We can only build on this success going forward," says WNS South Africa Managing Director, Johann Kunz. He adds that recognising the contributions made by the providers operating in the South African BPO industry, like the National BPESA Industry Awards aims to do, is critical for moving the industry forward. "South Africa has built a reputation as an international destination for quality customer interaction services, and we need to continue to celebrate successes in this regard," he continues. "It is exciting to also note that the industry is progressing to offering a broader range of more complex business processes like finance and accounting, human resources and IT, among others. South African BPO solutions providers and other industry players definitely have the potential to shine in these arenas too. This will certainly help to strengthen our country's value proposition and move South Africa further up the value chain to become as the world's leading global outsourcing destination," concludes Kunz. WNS (Holdings) (NYSE: WNS), is a leading global business process management company. WNS offers business value to 200+ global clients by combining operational excellence with deep domain expertise in key industry verticals including travel, insurance, banking and financial services, manufacturing, retail and consumer packaged goods, shipping and logistics, healthcare and utilities. WNS delivers an entire spectrum of business process management services such as finance and accounting, customer interaction services, technology solutions, research and analytics and industry specific back office and front office processes. As of 30 September 2016, WNS had 31 719 professionals across 42 delivery centres worldwide including China, Costa Rica, India, Philippines, Poland, Romania, South Africa, Sri Lanka, United Kingdom and the United States. For more information, visit www.wns.com. WNS Global Services SA has been in operation since 2003 and has built a reputation as the industry leading business process outsourcing (BPO) company in South Africa, with a growing footprint into Africa. It is a strategic partner for delivering a full range of basic to complex business processes from its eight delivery centres across South Africa, employing 4 000+ people.